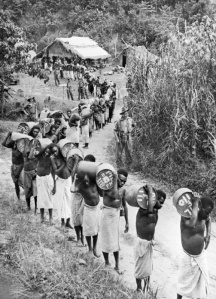 Papuan natives, known affectionately to the Australians as ‘Fuzzy-Wuzzy angels’, carry supplies during the fighting near Wau in New Guinea. The Australian forces owed much to native carriers who kept the forward troops supplied and helped to evacuate the wounded. Answered on the Owen Stanley track. And scratch pins in their hair. Thank you – I appreciate your assistance in showing these men recognition for their sacrifices and contributions. You’re welcome! It’s my pleasure to share stories like these.